Mr. Noah received his B.A. degree in Government with honors from Northeast Louisiana University (University of Louisiana at Monroe) in 1975 and his J.D. degree from Louisiana State University in 1978. He has served as General Counsel for the Ouachita Parish School Board since 1988. Mr. Noah has experience handling various types of litigation, including personal injury, desegregation, employment discrimination, and construction issues. 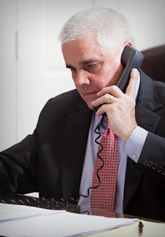 His practice has also concentrated in the area of insurance defense with an emphasis on medical and dental malpractice. He has served as both general and special counsel to several civil service boards and other public bodies. Mr. Noah is a member and past president (1998) of the Fourth Judicial District Bar Association, the Louisiana State Bar Association (Assistant Bar Examiner, 1988-2003), the Louisiana School Attorneys Association, and the National School Boards Association Council of School Attorneys. He is admitted to practice in the U.S. District Court for the Western District of Louisiana, in the U.S. Fifth Circuit Court of Appeals, and in the United States Supreme Court. Mr. Noah is a resident partner in the Monroe office.